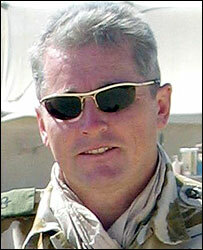 A Belfast-born Army officer cleared of alleged war crimes during the Iraq war is to be honoured with an OBE. Colonel Tim Collins achieved world wide fame with a rousing eve-of-battle address to his troops, but was later falsely accused of mistreating prisoners. He was found not guilty of any wrongdoing during the war last month, following a Ministry of Defence investigation. His is one of 350 honours for those involved in the conflict, including one George Cross. He was a lieutenant colonel with the 1st Battalion the Royal Irish Regiment during the conflict, but has since been promoted to the rank of colonel. In his address to the 1st Battalion of the Royal Irish Regiment, he said: "If you are ferocious in battle remember to be magnanimous in victory." "If you are ferocious in battle remember to be magnanimous in victory. The speech earned him lavish praise from the Prince of Wales and was admired by US President George W Bush. It was said that the president even had a copy of the speech tacked up on the wall of the Oval Office. 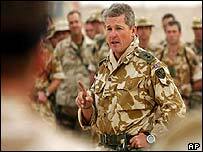 Colonel Collins is currently involved in setting up a peace support training centre in Sarajevo. He has also been working at the Joint Services Command and Staff College in Shrivenham, Berkshire. Commenting on his award, the Ministry of Defence said: "Colonel Collins' personal contribution to the success of Operation Telic has been immense, innovative, sustaining, unstinting and selfless."